Today we visit the location of a largely forgotten old resort from the Victorian Era, Lechauweki Springs. The name Lechauweki is the Lenape Indian word for the Lehigh River. The springs are located on a hillside in Fountain Hill. The borough of Fountain Hill is technically considered a suburb of Bethlehem, though for all intents and purposes, it is practically a neighborhood of Bethlehem. It is located just across the Northampton County border from Bethlehem in Lehigh County. The large St. Luke's Hospital was built in the borough and it has long been the primary hospital for Bethlehem. Fountain Hill and Bethlehem are adjacent to each other and almost fully intertwined. Edwin Drake, the driller of the first successful commercial oil well in Titusville, lived out his remaining years in the Fountain Hill/Bethlehem area. He moved to the area after word of his poor health spread, and a great outcry and charitable outreach ensued. The Pennsylvania General Assembly gave him a 1500 dollar pension. A man by the name of Francis Oppelt utilized springs nearby to create a hospital. He had no medical training, but he believed that drinking and bathing in pure water could cure all ailments. His facility was known as "Oppelt's Water Cure" and the "Hydropathic Institute." His facility was founded in 1846 and went out of business in 1871, a year after Drake moved to the area. St. Luke's Hospital opened up on Oppelt's land in 1872. 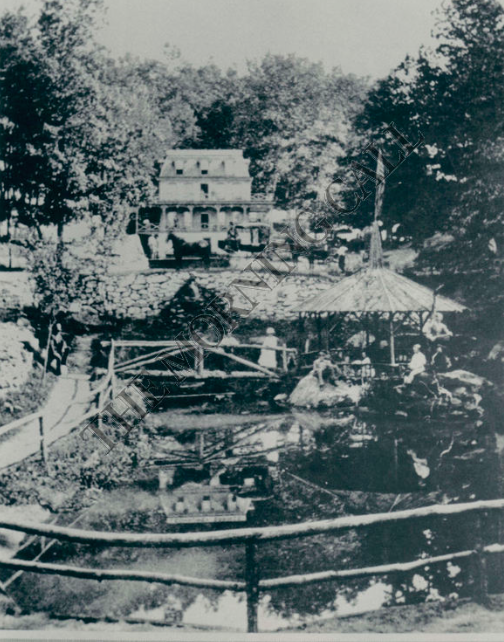 Drake's move to Bethlehem was likely for the supposed healing powers of the mineral springs in Fountain Hill. The water cure was highly sought out, even attracting General Sherman from the Civil War. Drake died in 1880. He was buried with a pauper's burial in Bethlehem, and was transferred to his grand burial plot in Titusville in 1902. The giant memorial was commissioned by Henry Rogers of Standard Oil. The mineral springs in Fountain Hill lead to the creation of Lechauweki Springs, about a mile away from the former site of Oppelt's Water Cure. People would ride the Lehigh Valley Railroad from New York and Allentown, and others would ride the Reading Railroad from Philadelphia and other places to spend time at these springs. A dance hall, entertainment facilities, accommodations, and more were set up here. People sought out the clear air, cool nights, parties, and the healing powers of the mineral springs, offered at Lechauweki Springs. A public park has been set up at the location, and a number of artifacts remain. A gazebo was rebuilt at the location where one once stood. The springs still flow through the area, though they are rather small. I initially came to see the remnants, which are pretty neat unto themselves, but I ended up really enjoying the cool temperatures of the forest, just as a visitor may have more than 140 years ago. The resort had three buildings, with 120 rooms. The success was short lived, only lasting from 1876-1880 or so. Business slowed down through the 1880s, and the resort shut down after a major fire in 1891. A number of private cottages built upon the road heading into the park remain as private residences to this day. A postcard view of the resort during its heyday. It is hard to imagine this serene area being hit o such a massive resort. There were three large trout ponds, with the remains of one of them seen here. The remains of one of the resort's three cold cellars. These stored provisions from the hotel. Lechauweki Springs is a beautiful place that you should certainly check out. If you are in the area, or better yet, if you live in the area, this is certainly place that you will enjoy exploring. There is a natural draw to this location, making it clear why the resort was built in the first place.